With its white head and black body, "NimbRo-OP" looks almost human. After all, at a height of 95 centimeters, it is almost the size of a small child. Among soccer robots, it counts as a "grown-up." Thanks to light-weight materials, its weight of 6.6 kilograms is, however, clearly less than that of a child. It has a total of 20 drive elements that convert computer commands into mechanical motions. This is also why "NimbRo-OP" is very agile - it has no problems kicking a soccer ball, and it can also get up from a prone position like a human, for soccer players also sometimes fall down. "We have made very effort to keep the design simple to allow other working groups to also use this robot as a basis for their work, modify and repair it," says Prof. Dr. Sven Behnke, lead of the Autonomous Intelli¬gent Systems working group from the University of Bonn. Source code and design plan of "NimbRo-OP" are open source. This is intended to facilitate entry into research on humanoids, in particular, the TeenSize Class of the RoboCup. The Bonn researchers used different humanoid robots as the inspiration for their project. "There are also other very interesting robots; but they are clearly smaller than ours," says Prof. Behnke. "But its size is essential for being able to do certain things, such as in robo-soccer." In addition, "NimbRo-OP" has a special wide-angle camera to get a view of the soccer field, and high processing capacity for swift response. This robot, which was recently presented at the IROS Conference (International Conference on Intelligent Robots and Systems) in Portugal, is a prototype. "NimbRo-OP is not suitable for consumers," says Prof. Behnke. "Our target group consists of scientists who want to program robots based on this hard- and software." The scientists from the Uni¬versity of Bonn also want to enter their robot in the RoboCup. This is a first step in the development project. "With this platform, we would like to achieve compatibility with other robots," says the computer scientist. Over the next three years, the development project will be continued together with igus GmbH Köln, an application partner, within a knowledge transfer project entitled "A humanoid TeenSize open-platform soccer robot." Prof. Behnke explains, "The goal of the project is accelerating progress in the humanoid robot area by intensifying the sharing with other groups of researchers." Chess computers have already proven that they can best human capabilities. "But humans are still clearly better at soccer than robots," the computer scientist from the University of Bonn reports. 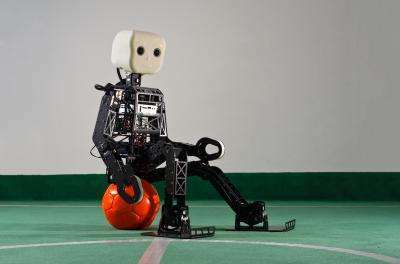 The requirements for soccer robots are high; they have to perceive environ¬mental conditions via cameras and inclination sensors, detect the goal posts, opponents and obstacles, and make and implement decisions in¬volving their team members. "There is still much to do to solve all the problems out on the pitch," adds Prof. Behnke. The scientists are using the RoboCup to experiment with complex challenges for bipedal robots that can potentially be used in many practically relevant environments beyond soccer. "For example, they are capable of using tools, climbing stairs, and passing bottlenecks that are too narrow for wheeled or tracked robots," explains Prof. Behnke. In addition, they can also use human facial expressions, gestures and body language for communicating. He adds, "Our goal is to stop re-inventing the wheel over and over; by using an open platform together with other researchers, we want to find solutions while saving on effort and expenses." The working group around Prof. Behnke is the most successful humanoid team worldwide at the RoboCup, and with wins in eleven individual competitions, quite likely even the most successful RoboCup team overall.